Luxury bath accessories by Labrazel for the final touch. These hand-painted glass accessories glow with muted shades of silver and gold. The pattern is captured on the reverse side of the glass in a centuries-old art form known as verre eglomisé. The glass panels are mounted on wood. This collection celebrates the beauty of Italian alabaster in all its variations. Alternating bands of translucent and opaque alabaster create subtle stripes that glow with diffused light. 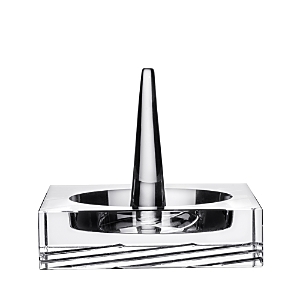 Each beautifully crafted piece features crisp corners and a softly honed finish. Bubbles suspended within clear glass add a touch of whimsy to this design. The bubbles appear randomly as the glass is blown, making each piece unique. Handcrafted in Peru, where artisans have produced remarkable reverse-painted artwork on glass since the 16th century. The intricate design is painted on mirrored glass panels and mounted on wood. The sparkling effects are created as portions of the mirrored backing are carefully removed from the glass and filled with color. The wood is finished with antiqued gold. With their baroque curves and decorative feet, Sofia vanity accessories have the look of a treasured antique tea set. Cast in pewter, each piece is carefully welded and polished for a seamless appearance. Mouth-blown glass. Fernwood veneers with natural flame graining are finished with a protective coat of acrylic. The color of the natural wood varies, ranging from amber to espresso. Mouth-blown glass with hand-cut leaf and vine pattern. Made in Italy Handcrafted ceramic bath accessories layered in metallic leaf and lightly brushed with antique glaze. Made in Italy. Sparkling lead crystal is mouth-blown, then cut by hand. Mouth-blown, hand-cut lead crystal. Handcrafted ceramic bath accessories layered in metallic leaf and lightly brushed with antique glaze. Made in Italy. 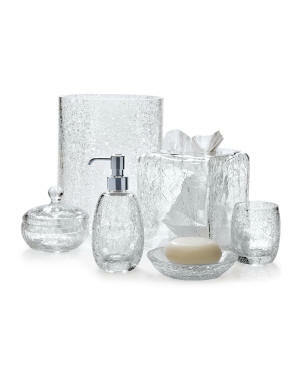 This clear glass has a wonderful crackle finish that catches and reflects light beautifully. To create the crackle effect, each mouth-blown piece is finished with with a special outer layer of glass that crackles as it cools. The interior remains completely watertight. 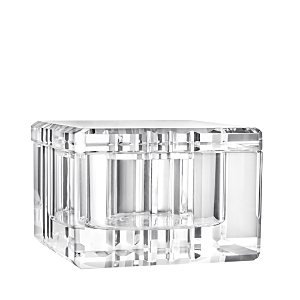 From designer Michael Berman, gorgeous crystal accessories with timeless style. The brilliant 24% lead crystal is mouth-blown and etched by hand. Playful frosted orbs create a subtle contrast as they encircle each piece. 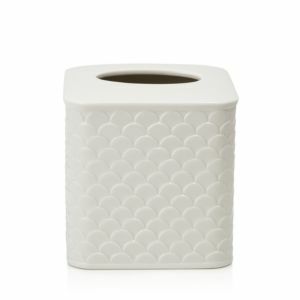 Handcrafted wooden wastebasket and tissue box cover feature hand-rubbed antique glaze for a vintage look. A light layer of satin acrylic protects the finish. Bath accessories in marbleized resin. Made of resin. Made of resin. Bath accessories finished to look like mercury glass. Glass bath accessories. Metal/wood base. Bath accessory collection made of lacquered wood. 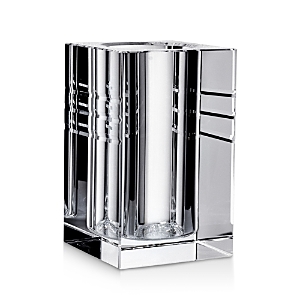 Antiqued mirrored vanity accessories combine beauty and functionality. Made of resin. Hand-lacquered resin; silver-tone trim. Vanity accessories made of porcelain have a pebble-textured gray finish that resembles shagreen. 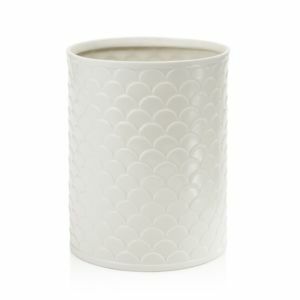 Made of porcelain with a faux-shagreen finish. Bath accessories wrapped in leather. Stripe it right with this refined lacquer collection of bath accessories. 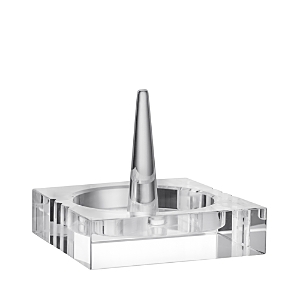 Each piece is detailed with contrasting symmetrical lines and a smooth finish. Give your bath space a touch of old world charm with this Orsay Bath Accessories Collection from Kassatex, featuring a floral design on beautiful white porcelain. Give your bath space a touch of old world charm with this Orsay Bath Accessories Collection from Kassatex, featuring a floral design on beautiful white porcelain. Give your bath space a touch of old world charm with this Orsay Bath Accessories Collection from Kassatex, featuring a floral design on beautiful white porcelain. With a distinctly eye-catching design, the Kassatex Arabesco accessories are crafted from resin. Each piece is then injected with ink by hand to create stunning contrast and bold shapes that grant each piece uniqueness. Made from Resin, each piece is light weight and durable for everyday use. With a distinctly eye-catching design, the Kassatex Arabesco accessories are crafted from resin. Each piece is then injected with ink by hand to create stunning contrast and bold shapes that grant each piece uniqueness. Made from Resin, each piece is light weight and durable for everyday use. With a distinctly eye-catching design, the Kassatex Arabesco accessories are crafted from resin. Each piece is then injected with ink by hand to create stunning contrast and bold shapes that grant each piece uniqueness. Made from Resin, each piece is light weight and durable for everyday use. The Alpine Accessories are a contemporary collection which features asymmetrical layers. This all white collection is artistic and subtle enough for a modern bathroom. Made from Resin, each piece is light weight and durable for everyday use. The Alpine Accessories are a contemporary collection which features asymmetrical layers. This all white collection is artistic and subtle enough for a modern bathroom. Made from Resin, each piece is light weight and durable for everyday use. The Alpine Accessories are a contemporary collection which features asymmetrical layers. This all white collection is artistic and subtle enough for a modern bathroom. Made from Resin, each piece is light weight and durable for everyday use. Crafted in fine porcelain with a subtle textured finish, these elegant bath accessories from Kassatex help to organize and store all of your bathroom essentials. Crafted in fine porcelain with a subtle textured finish, these elegant bath accessories from Kassatex help to organize and store all of your bathroom essentials. Crafted in fine porcelain with a subtle textured finish, these elegant bath accessories from Kassatex help to organize and store all of your bathroom essentials. Bath accessories in diagonal stripe pattern. Made of black and white stone. Bath accessories in basket weave design. Crafted of porcelain. Crafted of glass. Bronze Bath accessories with faux-shagreen finish. Made of polyresin. Gray, teal Bath accessories with contrast diamond pattern. Made of two-tone inlay shell. Bath accessories in chevron design. Made of inlay shell and stone. Bath accessories in ikat pattern. Made of polyresin. Bath accessories with Greek key detail at corners. Made of stone with inlaid shell. Bath accessories made of inlay shell and stone. Bath accessories with Greek key border. Made of two-tone inlay shell. Bath accessories in striped pattern. Made of lamination and shell. 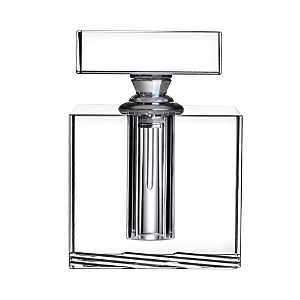 Crystal The sleek lines and clear glass of the Stripe collection from Orrefors add opulence to bathroom or boudoir environments. 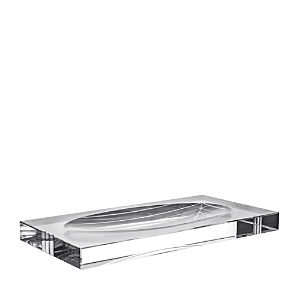 The sleek lines and clear glass of the Stripe collection from Orrefors add opulence to bathroom or boudoir environments.